BANGKOK (AP) — A publicity-savvy activist in Thailand seeking to run in an upcoming election has learned one of the unwritten rules of his country’s politics: pirates need not apply. Sombat Boonngamanong, who recently established his own party, sought to attend a meeting Friday of the state Election Commission where the rules for the polls were being explained, but was barred because he was wearing orange construction overalls and a pirate’s hat with skull and crossbones. And big white sunglasses. He said his hat was a reference to so-called pirate parties that originated in Europe and promote freedom of expression and civil liberties. He said he donned construction clothing because, after four years of military rule, Thailand needed repairing. By doing so he was ribbing the ruling junta, which has summed up its time in power as “four years of repairing and rebuilding.” The military for its part stole the slogan from former Prime Minister Thaksin Shinawatra, whom it ousted in a 2006 military takeover. Thailand has been under military rule since another coup in 2014 ousted an elected government. Only recently has it loosened a ban on organized political party activities, a prelude to a general election to be held between February and May next year. Sombat is a well-known pro-democracy activist who led early protests against the 2014 coup. He organized them via social media while leading authorities in a round of hide-and-seek. He was eventually arrested and spent nine days in detention. There are still two legal cases outstanding against him. 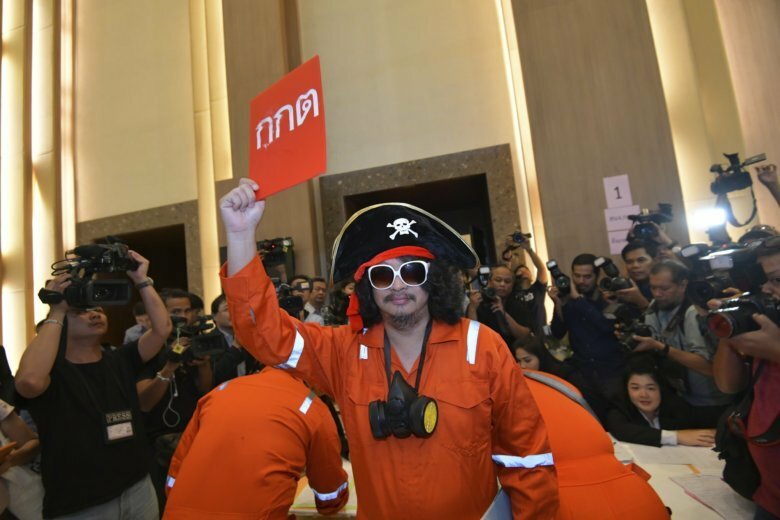 Sombat said an Election Commission official told him that his pirate costume was inappropriate. Sombat said an official told him later that he would receive a letter next Monday detailing the voting process. He recently formed the Grian Party, but the Election Commission objected to the name and refused to register it. It roughly translates as the Troll Party. But after Sombat changed the name of his party from Grian to Gian — meaning “ocean” — the commission agreed Friday to register it. He told reporters he now has to think about what to wear when he picks up the party approval document next week.